Palm Coast's double decker bus, dubbed the 'Get to Know Us' bus and which was once part of the London Transport Fleet provided a real European touch and much fun at a recent open house held at the Daytona International Speedway. Captain Kevin Fearon, formerly with the Merchant Marine and now the head of Palm Coast's "Fleet," drove the bus around the two-and-one-half-mile tri-oval and in a few hours had carried about 1,800 people. 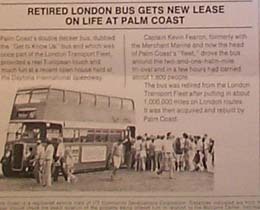 The Bus was retired from the London Transport Fleet after putting in about 1,000,000 miles on London routes. 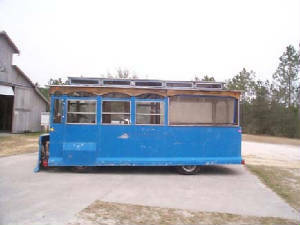 It was then acquired and rebuilt by Palm Coast. From: The Palm Coaster, Vol. 5, Number 3 Fall Issue 1974 p. 4. We will let the Future Researchers seek out how the element of the Transportation problems in/around 2008 was addressed in this Planned Community. In early 2008 a person could not sign up for Flagler County Transport unless a vacancy came up through a death or someone moved away. We could not sign up or even get a reply to our many E-mails requesting information on Public Transportation. This is one of our Palm Coasts' Trolleys now at the Florida Ag. Museum.